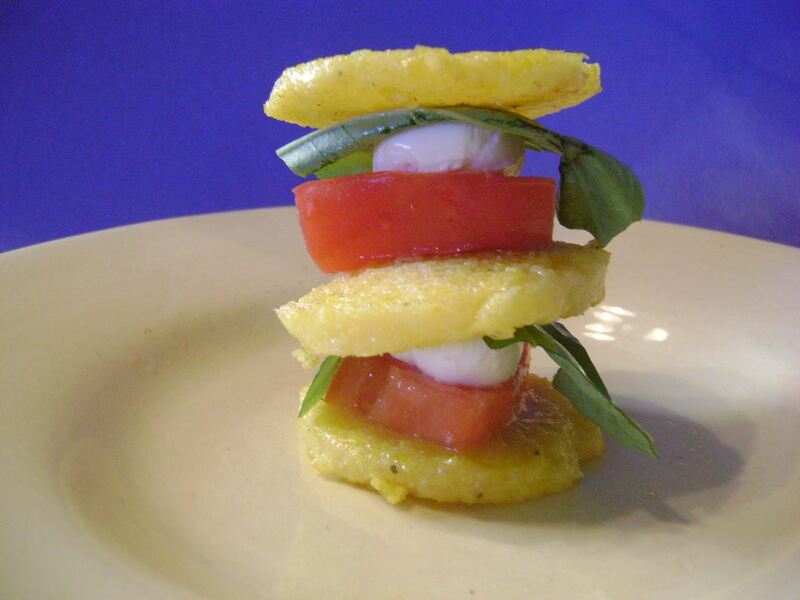 The “glue” layer (the hummus) seemed a little bit oozy, so next we tried a little more of a structural challenge with a polenta stack. We got a tube of polenta, sliced it into discs, and sauteed it in a little olive oil until it was crispy (our three-year-old calls these “dinner pancakes” and gobbles them up straight out of the pan). 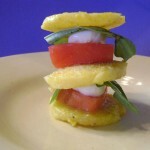 We layered these with farm-fresh tomato, basil, and fresh mozzarella. 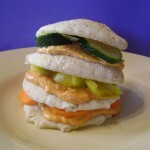 Did the stack last for more than 30 seconds? No, but who cares? It was mighty tasty, even after it fell over. At this point the boys were ready for something sweet so we got out the good stuff. 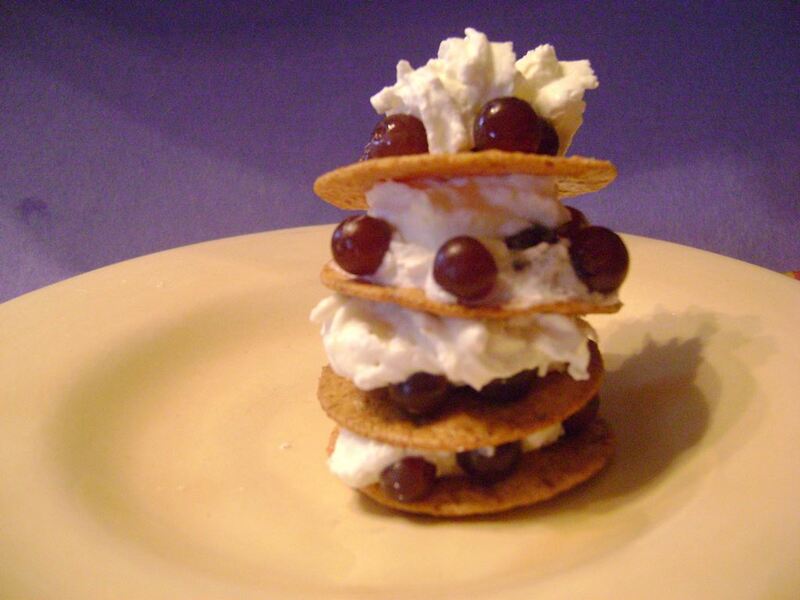 We layered thin crispy crackers with whipped cream and tiny Champagne grapes. 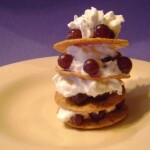 Surprisingly, this one seemed to stack the best and the highest – the whipped cream acted as glue and held the grapes in place, and it was lightweight enough that it didn’t topple when we added more layers. On the top layer we gave it an extra dollop of whipped cream just for kicks, much to the boys’ delight. 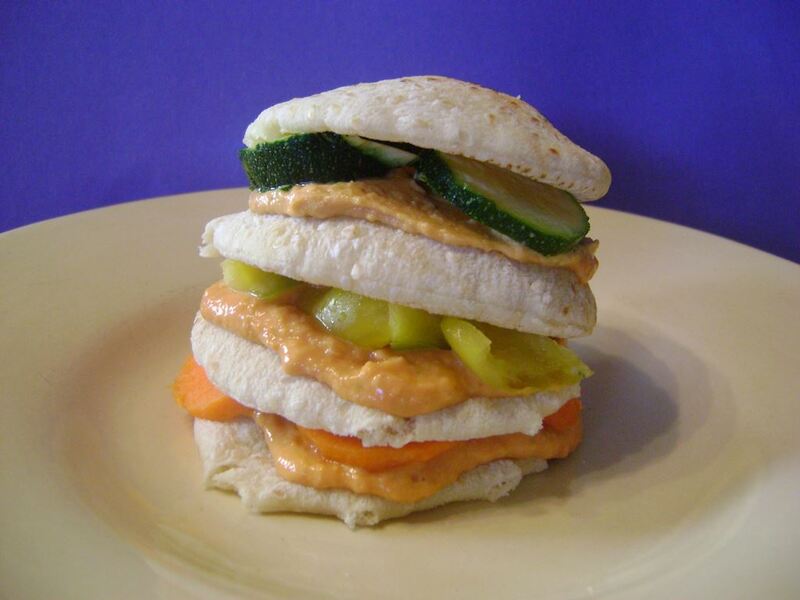 After doing a few of these and trying to get more ideas, we learned that there’s a whole book on the topic called Stacks: The Art of Vertical Food by Deborah Fabricant. But it looks like what she’s trying to do is a little, er, fancier than our capabilities. To make those pretty molds, many of the recipes use stack cylinder pans, ring molds, or even recycled soup cans to give it a nice shape. That would make for a cool dinner party recipe someday, but for now we’re just focused on building tall towers and picking up (or in this case, eating) the pieces.